Last year, EA Sports' FIFA finally managed to surpass long-time nemesis Pro Evo and emerge as the number one football game in the world, both critically and commercially. Let's see what it's managed to do in the 12 months since. Superficially, it appears it's done very little, especially when compared to the drastic overhaul that's been made to Pro Evo's visuals. But then, superficially doesn't count for squat around here. Loose as a Goose – For the first time ever in a FIFA game, your players aren't restricted to eight-directional movement. There's true, 360-degree recognition of where you're pointing them, allowing for incredibly fluid control over where your player is headed. It sounds like your standard back-of-the-box bullet point, but in reality, it's as fundamental and impressive an improvement as a new graphics engine. Ball Control – The same fluidity now carries over into ball control as well. When receiving the ball and running onto it, it no longer appears pre-programmed to simply attach itself to their feet. It truly has a life of its own, making the whole game flow naturally, and appear almost lifelike. Another plus is that, aside from a single routine where the keeper punches a corner to the same spot every time, there's no sense that the ball is following a pre-determined route. It just feels... random. Unpredictable. Just like a football on the loose should be. Jumpers For Goalposts – FIFA has long had the finest commentary of any sports game on the market, and FIFA 10 is no exception. Remarkably, Martin Tyler and Andy Gray have been dragged back into the recording studio and, atop lines we've heard in previous examples, recorded a ton of new chit-chat as well, bringing the volume and quality of commentary closer to that you'd expect from a real broadcast than any sports game I've ever seen. Well, heard. Training Days – The training ground makes a welcome return to FIFA 10, allowing players to get a handle on certain settings and concepts while fine-tuning tricky moves like set pieces. It was a nightmare trying to learn all this in-game, where some games you may not even get a decent set piece to practice, so having the chance to test it outside of game day—it's activated on the main screen's "arena mode"—is appreciated. Role-Playing Game - You remember that stuff I was on about in a recent feature, talking about sports games incorporating RPG elements? 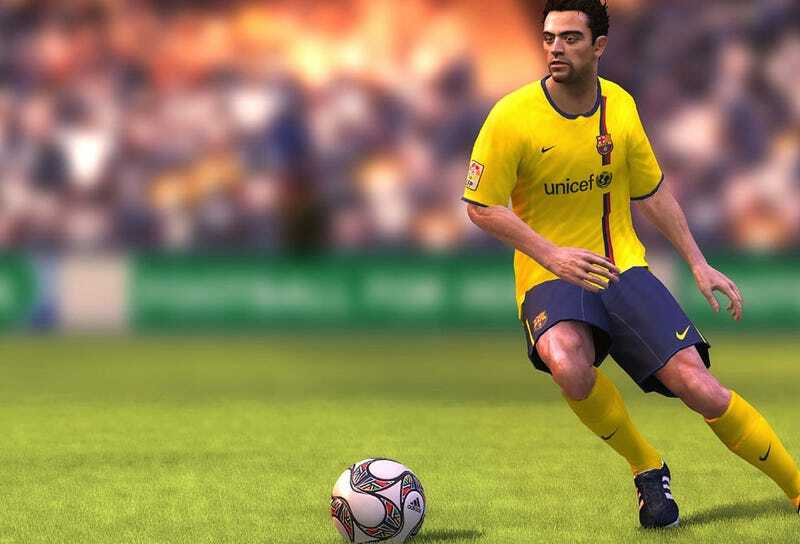 FIFA 10 doesn't incorporate elements, it is an RPG, thanks to the new "Virtual Pro" mode. There's now an option to create a player that is "stuck" in the game's roster database, and can be used in "Be A Pro", single-player, season, multiplayer, the works. Every game you play, every goal you score or tackle you make in any game mode improves their stats, with progress milestones rewarded with attribute upgrades and trinkets like celebrations and better boots. It's a captivating addition to the game, and one which will surely become the focal point of the entire thing for many people. Fix Up, Look Sharper – While significant improvements have been made to the nuts and bolts of the game, FIFA 10's more visual aspects are starting to show their age. There's been little improvement to the cartoonish stock player models (which are trumped this year by a resurgent, gorgeous Pro Evo), and it's a shame to be stuck with the same menu system for what is at least the third year running. You know, when you play a team sports game, you're expected to lower your expectations of what you're about to see "simulated". That what you're about to experience is a game based on a sport, and not the sport itself. But thanks to the greater sense of fluidity in FIFA 10, both from the players and from their control and movement of the ball, FIFA 10 comes close (damn close) to both feeling – and, for spectators, looking - like the real thing. And there's no higher compliment for a sports game than that. FIFA 10 was developed by EA Canada, and published by EA Sports for the Xbox 360 (version reviewed), PlayStation 3, PlayStation 2, PlayStation Portable, Nintendo Wii, Nintendo DS, PC & iPhone. Released in Europe on October 2, in North America on October 20. Retails for $59.99. Played all game modes in single-player, and several matches in multiplayer, both locally and online.